CORE COLLECTION * Windrow * Flexblade Collector. SURFACE CARE * Roller * Surface Iron. The Groundsman Caster Wheel Attachment allows easy turning of the 345HD/MD and 460HD Groundsman Pedestrian Turf Aerators. The latest attachment for the Groundsman 345HD/MD Pedestrian Turf Aerators, is the Groundsman Seeder & Drag Brush. efficiently spreads surface seeds down into the seed beds. The Flexblade Core Collector is a patented implement developed by Groundsman Industries. This is available for the Groundsman 8120CTM and 12180TM tractor mounting turf aerator machines for coring and collection in one pass. It can save many hours of manual work or an extra operation with heavy cumbersome equipment. It is clean and efficient with over 60% of the cores entering the collector without touching the ground. The remainder are scooped cleanly from the surface by a series of platelets which follow the contours acting like shovels keeping the greens open for play. Pedestrian operated Turf Aerators. This attachment gathers the soil cores into a centre row for easier collection. It is attached to a slotted bracket to each side of the rear flap and secured by two spring pins. An adjustable lift chain pulls the attachment clear of the ground when the machine is raised. The surface roller attachment is available for all the Groundsman Pedestrian turf Aerators. It is used to smooth out the surface of fine turf when needle tining or spiking is performed. This implement can help prevent scalping around the hole parameter on the follow up cutting especially if the mower is set very low. It attaches the same way as the Windrow. The surface Iron effectively performs the same task as the Surface Roller Attachment on the Pedestrian Turf Aerators. This system works in the same principal as the Flexblade Core Collector except the leading edge is turned upward like a ski whereby follow the surface contours. This system is flexible on the surface of rolling terrain making it more effective than a roller on the wider tractor mounting machines. It is used, as with the roller, to smooth out the surface when needle tining or spiking. 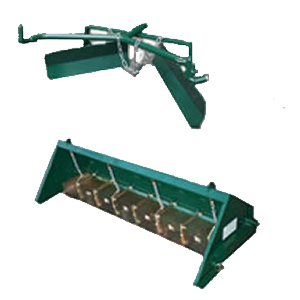 A tie down bracket is available to give convenient and secure tie down locations between the front and rear axles on the pedestrian operated Turf Aerators. The brackets come complete with mounting bolts and bolt holes are provided on the chassis sides. These brackets will prove invaluable when transporting the machines between sites. The Elliptical Plunge Action tining mechanism on the Groundsman range of surface aerators causes very little surface lifting. However, in circumstances where the roots are particularly shallow, turf retainers are available for all pedestrian and tractor mounting Aerators. Holes are provided in the chassis sides to bolt the mounting bracket to finger holders and a spring loaded mounting bar provides a quick attachment for the finger‐bar holders which are available for Twin, Triple and Quad Holders. roller. Spring loaded brackets extend over the roller rearwards onto which the Turf Retainer Holders are bolted in pairs. This system allows the retainers to follow the contours of the surface while maintaining a constant pressure on the turf to prevent lifting. The rack is supplied with Blank Retainer Holder Flanges to keep the clamp bolts secure when retainers are not being used. Turf Retainer Holders are required to hold the plastic retainer sections. One wide holder is required in each set. The model 8120 machine requires 8 retainers ie: 7 standard and 1 wide. The model 12180 machine requires 12 retainers ie: 11 standard and 1 wide. The Holders have a bolted bottom plate which clamps the plastic retainers to the holder body. The Holders are universal accepting Twin Triple Quad and Quint Retainers. As with the Tine Holders, it is a good idea to have set of Holders for each set of Retainers for convenience. Twin Turf Retainers can be used with all Twin Holders no matter which Tine is being used. One wide retainer TR2W is required with each set, it is always fitted to to extreme left of the machine as viewed from the rear. There are seven standard and one wide retainer in the model 8120 and eleven standard and one wide retainer in the model 12180 Turf Aerator machine. Triple Turf Retainers can be used with all Triple Holders no matter which Tine is being used. One wide retainer TR3W is required with each set, it is always fitted to to extreme left of the machine as viewed from the rear. There are seven standard and one wide retainer in the model 8120 and eleven standard and one wide retainer in the model 12180 Turf Aerator machine. Quad Turf Retainers can be used with all Quad Holders no matter which Tine is being used. One wide retainer TR4W is required with each set, it is always fitted to to extreme left of the machine as viewed from the rear. There are seven standard and one wide retainer in the model 8120 and eleven standard and one wide retainer in the model 12180 Turf Aerator machine. Quint Turf Retainers can be used with all Quint Holders no matter which Tine is being used. One wide retainer TR5W is required with each set, it is always fitted to to extreme left of the machine as viewed from the rear. There are seven standard and one wide retainer in the model 8120 and eleven standard and one wide retainer in the model 12180 Turf Aerator machine.